Happy Tuesday, Friends! Is anyone else running around like a nut after Thanksgiving playing catch up? I’m trying to clean up the Fall decor while simultaneously dragging out my Christmas decorations! My dining room is still left over wedding central. I need to put everything away, but meanwhile, I ran across a few pearls and faux flowers I used to decorate the flower girl baskets for my son’s wedding recently. 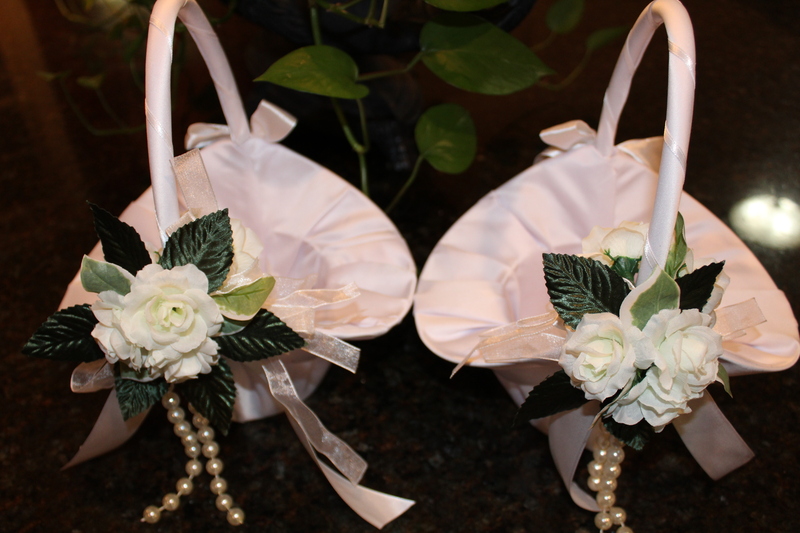 Who would have thought flower girl baskets are tricky to find? The baskets were already pretty, but I wanted to add some simple faux flowers and greenery to match the flowers in the wedding. All of the other flowers were a monochromatic mix of white flowers and greenery. I found these pretty little clusters of faux flowers at Michael’s. They were attached by strands of translucent white ribbon so I cut apart each cluster and used one per basket. I twisted on some shiny green leaves to add additional shades of green. And for good measure I added a small strand of pearls as well. I only embellished the one side and left the other side with just the white bow. Here are the darling flower girls in action, dropping white rose petals with precision. So adorable! The flower girls preceded the lovely bride and her proud Father. It was beautiful. So the flower girls got to keep their little baskets for what I’m sure will involve lots of future make believe, dress up and probably reliving their special day as flower girls. Who knows? Maybe they will use them again next year for another family wedding? We shall see!